I spent more time than I'm proud of thinking of a 'punny' title for this, and couldn't. What a disappointment. If you have a good one (or even a bad one), write it in the comments. You can never write the Australians off, and with only one Test completed the series can still, technically, go either way. Based on performances so far, England are certainly the favourites - but that doesn't mean that our top batsmen can sit back and rely on the Australians' ineptitudes to wipe the egg from their faces. Personally, I would rather see the runs shared more equally, with every player in the squad pulling their weight - it would be more encouraging to see the top six or seven batsmen all making around 40 to 60 runs each, rather than one guy making a Double Century, while the others get themselves out before they reach double figures. Everyone has better days and worse days at the crease, and of course there are a myriad of factors which can affect this, but the likes of Alastair Cook (12, 8 this Test) and Kevin Pietersen (2, 5 this Test) need to step up pretty soon. It's not that I think Cook or Pietersen are bad cricketers (on the contrary, in fact, I have a lot of respect for both of them), but test cricket is a long game, and the Ashes is a series of five Tests - ultimately, consistency is key, and if it weren't for the Australia's woeful performance so far during this Test I fear England would already have been found out. Blue The Dog was only a small bundle of fluff with a raggedy string for a tail and legs which didn’t quite know what their purpose in life was yet, when I sat in the back of my Dad’s car, holding on her my lap, as we drove home from the breeder’s house where we’d bought her. I was eleven, and the idea of getting a puppy was one of the most exciting, thrilling things I’d ever experienced. From the moment we got her, Blue was fun to be around, inquisitive and characterful, and above all, totally loving - she would play with me when I was happy, and she was the perfect furry shoulder to cry on in times of sadness. I grew up with Blue around, and she was a part of family life for me for the majority of my life. Sadly, Blue left us around nine o’clock this morning. Blue was the sort of dog whom everybody loved. She was friendly and lively, and loved to meet new people - but not so overpowering that she would knock you over and drool all over you when you met her. She never had an ounce of malice or aggression in her - just a huge amount of love for everyone she met. As a puppy, she was inquisitive and playful, and though she mellowed a little as she grew older, she never fully lost that curiosity. 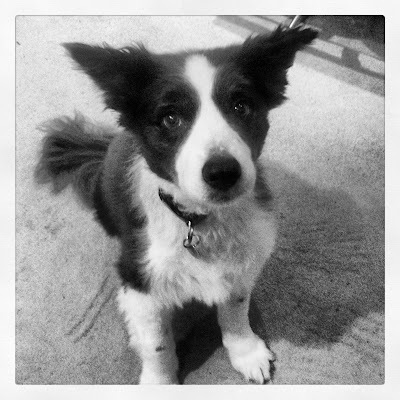 As a border collie, she had the sharp mind of her breed, and she was always keen to explore new areas, and make new friends, everywhere she went. I remember how she sneezed the first time she ever saw snow, and it was unexpectedly all cold and wet on her paws, and up her nose - what a surprise! When she was still very young, Blue had a job offer - to work as a therapy dog, helping to bring comfort and affection to the elderly, sick and infirm. In many ways, this was her true calling, for she loved people, and affection truly was her middle name, but we (as a family) never had the time or resources to commit to this. She remained perfect therapy dog material her entire life, though… Only weeks before she died, the mother of a piano student coming to our house for a lesson remarked how her daughter had recently had a bad experience being bitten by a dog, and was now very nervous of dogs and didn’t like them at all - after spending a little time with Blue, the student said ‘oh, but I like this dog, though!’ If any proof were needed of Blue’s inimitably gentle and loving nature, this is it. It’s difficult to write coherently about Blue at this time (so I may have another crack at this a little further down the line), but I am grateful that she did not have to suffer prolonged pain or invasive surgery at the end; she is at peace now, and while I miss her terribly (and that isn’t going to change any time soon), I can at least look back on many happy memories of times shared with her - at the beach, on family holidays, at Christmas time, at the village pub, on the river, and really anywhere that we went. 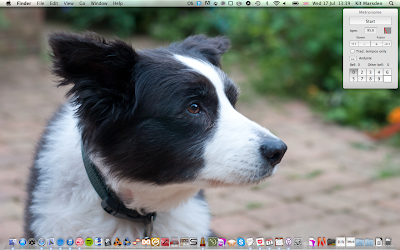 In some small act of tribute, I have changed the desktop background on my laptop to a picture I took of Blue last June. I am hoping to get a printed and framed copy soon, but these gestures are just small tokens of thanks for the years of love, affection and companionship Blue gave me. I am working a lot today, and over the coming weekend, but I hope that at some point in the not-too-distant future I will find time to raise a glass to a small collie dog who meant the world to me. If you’re also not too busy, wherever you are, then maybe you’ll join me? I know Blue would’ve loved you. Chargrilled chicken with caesar dressing, cos lettuce, bacon and Parmigiano Reggiano cheese shavings in dark rye bread. Having been a fan for some time of chicken & bacon caesar wraps (I have not mentioned this before, as I do not view tortilla wraps as being included under the 'Sandwich Review' parasol - this may change at some point, but not as yet), I was interested to try this sandwich version. I am very much a fan of this combination of ingredients, and so it was with great anticipation that I tucked into this sandwich. The only part of this sandwich about which I was dubious was the use of rye bread - much as I enjoy a fancy bread in sandwich-making, I had misgivings about this as I had remembered rye bread as being rather heavy and dark, with an almost bitter taste. Thankfully, though, my reservations came to naught - the potential bread problems which I had foreseen failed to materialise. There were, however, other problems with this sandwich... The flavour of anything 'caesar' relies on the dressing - and in this case, there simply wasn't enough. Not only did this have the effect of leaving the sandwich a little dry, it also detracted greatly from the taste - put simply, this Chicken & Bacon Caesar sandwich just wasn't caesary enough! It's easier to put enough dressing into a Caesar wrap - the enclosed nature of a tortilla wrap means issues of dressing spillage are lessened. Of course, I recognise the inherent issues with dressings in sandwiches - it is a fine line to tread between having not enough, and having too much. (Not enough will leave the sandwich dry and bland, but too much will result in a sandwich which ends up soggy and a dressing which dribbles out as you try to eat, and ends up all over your hands instead.) It's a tough balancing act - but Waitrose ought to be able to manage it. Sadly, they didn't, and despite the otherwise excellent nature of this sandwich, I was left disappointed, and will therefore not be buying this sandwich again. Apologies for the photo quality - I was so hungry at this point that I ate the sandwich straight away, before I thought to photograph it. Smoked turkey, Emmental cheese and ranch dressing with vine ripened tomatoes, bacon and apollo lettuce in bar marked white bread. A club sandwich is never quite such a good idea as it seems when you buy it - the extra slice of bread in the middle adds nothing but extra bulk, and quickly turns soggy (and therefore not very nice) if it comes into certain other ingredients (tomatoes, in particular, tend to have this effect). Sadly, plenty of perfectly viable sandwich concepts have been spoilt by having been turned into 'club' versions, rather than just sticking with a standard 'filling between two slices of bread' approach. 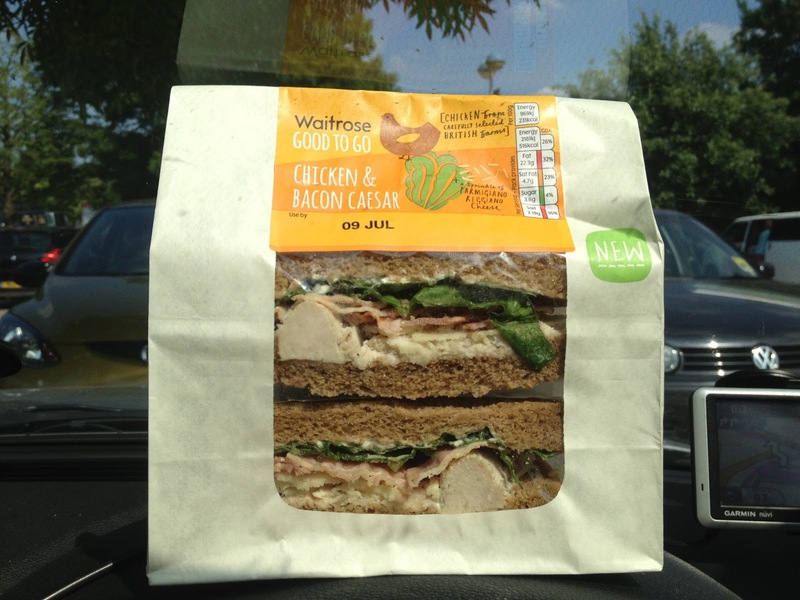 Having said that, this sandwich was very enjoyable. 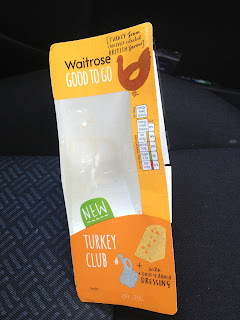 I still felt that it would have worked just as well (if not better) as a standard sandwich, rather than a club sandwich - but leaving that aside, the filling was excellent. The salad was fresh and crisp, the turkey was not dry (this can often be a problem with this particular meat) and the ranch dressing was full-flavoured without being greasy or overpowering. 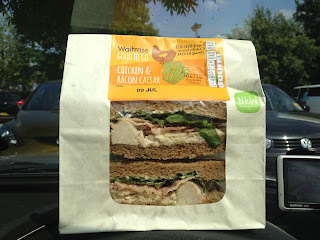 Despite my reservations about 'club'-style sandwiches in general, I would buy this sandwich again.